The Georgian National Platform of the Eastern Partnership Civil Society Forum condemns the death in custody of the Georgian citizen Archil Tatunashvili in Tskhinvali on February 23, 2018. 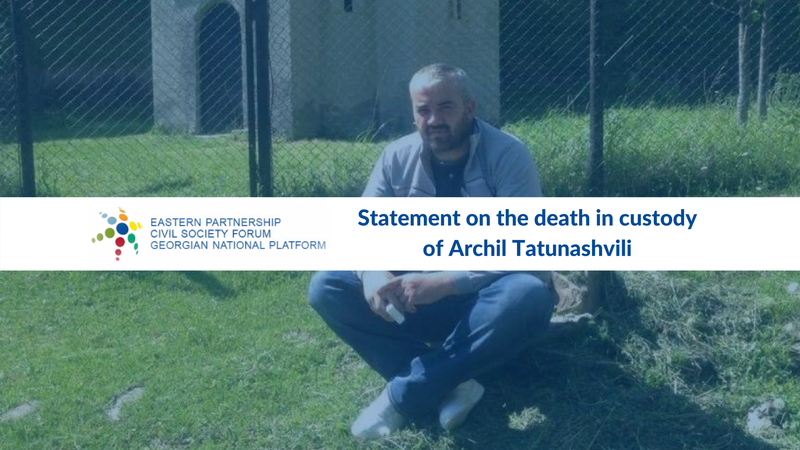 Our members denounce the alleged violence that led Mr Tatunashvili to death and urge the Russian Federation and the South Ossetian de facto authorities to hand over his body to his family in Tbilisi-administered territory in order to deescalate tensions. They also call for the immediate release and peacefully return to their families of the two other Georgian citizens detained with Mr Tatunashvili in the South Ossetian occupied territory, Mr Levan Kutashvili and Mr Ioseb Pavliashvili. Furthermore, the Georgian National Platform hopes the case will be discussed in the European Court of Human Rights in Strasbourg and calls the international community to put pressure on the Russian Federation to resolve the crisis. The Spokesperson of the European External Action Service (EEAS) published a statement raising concerns about the latest developments in South Ossetia, including the death of Archil Tatunashvili. Through its Monitoring Mission (EUMM), the EU aims to support ongoing investigations and to facilitate discussions through the Incident Prevention and Support Mechanism and the Mission Hotline. The Co-chairs of the Geneva International Discussions of the Organisation for Security and Co-operation in Europe (OSCE) and the Congress President of the Council of Europe also released respective statements in which they regret the death in custody of Mr Tatunashvili and urge the authorities in control in Tskhinvali to hand over the body to his family without delay.